Why is My Internet Explorer Browser Freezing? Internet Explorer has been freezing for the past couple of weeks ever time I access my hotmail account. The behavior occurred regardless of the number of times I rebooted, closed the browser, tried again, or closed all other applications and tried again. It is really more annoying than the brain freeze one experiences when they eat ice cream or some other frozen dessert too quickly. Ok, I admit, my first thought was, ugh, one of the recent hot fixes from Microsoft is causing problems. Well, this morning when I booted up my computer, I noticed a message from the Windows Action Center in my toolbar. 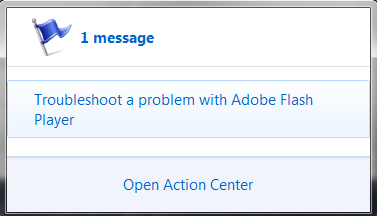 The message shows that there is a problem with the Adobe Flash Player. I clicked the link from the message and was taken to the Adobe site. There I was prompted to download what I initially thought was an update. I also noticed the message to first uninstall the Adobe program but I decided that wasn’t necessary (hehe) and selected the link to download the update. Well, after a few unsuccessful attempts to complete the install, I decided to follow the instructions and uninstall Adobe from my system. After uninstalling all the Adobe programs from my system, I rebooted and attempted to access my hotmail account from my Browser and hooray, no Freeze! The next test was to install the Adobe Flash Player and see if the infamous Browser freeze returned. I selected the link for Adobe from the Action Center prompt again and began the process of installing the latest Adobe release. By the way, Adobe if you are listening, stop making me unselect the Google toolbar checkbox and stop adding an Adobe Icon to my desktop, its annoying, thank you. The Adobe Flash program installed with no issues. I opened my browser, went to my hotmail account and gave a big sigh of relief. The freeze issue was gone, hopefully for good. Isn’t Microsoft Windows 7 just simply wonderful! I love the new Action Center feature. It has definitely made my work life less stressful, more productive, and saved me countless hours of troubleshooting time. Thank you Microsoft!! Previous Post: CRM – My Entities Won’t Import?